It's a greatsubmitted by Emmanuel Z. - Mar 19, 2019 |Recommended: YesThe apartment complex is very nice. The only issue is the school traffic in the morning and afternoon. response from property - We very much appreciate the 5 Star review. Please let us know if can be a service to your during your residency with us! Great place to livesubmitted by Kelvin T. - Mar 02, 2019 |Recommended: YesMove in September 2017, worked with Teresa before we actually moved to the area. She was very helpful and worked with us to ensure that we had a easy transition from Texas. response from property - Thanks for the 5 stars! An excellent place to live...submitted by Stephen B. - Dec 06, 2018 |Recommended: YesNewly constructed community with first rate customer service from management and maintenance team. They truly go out of their way to ensure you have a wonderful experience living here. In my 27 years of moving around in the military, this community has been the best one to live in by far. response from property - Thank you so much Mr. Bonner! We are all very happy to have you here and even happier you decided to say with us for another year! response from property - Thank you for letting us know about your concerns. Our goal to do whatever is within our means to make sure you have an enjoyable experience. Please know that all concerns and complaints are taken seriously and are addressed appropriately. If you are still continuing to have issues, please call or stop the office so we can see what further action can be taken. The last thing we want is to lose you as a resident! response from property - Oh WOW! Thank you so much! It means a great deal to us that you have taken time to acknowledge the things we are doing right! We try very hard to make Ashton Ridge the best place to live and it is residents like yourself that makes what we do so rewarding! Our next event is in December, can't wait to see you there! Make sure your friend mentions your name when she applies! We love resident referrals! response from property - Thank you so much for the 5 star! Please let us know what we are doing right so we can keep doing it! response from property - Thank you so so much! It's kind words like yours that make our jobs worth doing! We are so happy to have you here! Great place to livesubmitted by Chicara S. - Oct 02, 2018 |Recommended: YesAshton Ridge has great staff and it is a very family oriented community. Love the pool gatherings and activities they have for kids. response from property - Thank you so much for your feedback! We truly do love our residents and try to do what we can to bring a community feel to the property. We enjoy hosting events for you all, and we hope to see you at our Fall Festival 10/20/2018... we have so much fun planned!!! Nicely keptsubmitted by Jena M. - Sep 30, 2018 |Recommended: YesSeals on doors are poor insects get in a lot, also asked for my storage deadbolt to be fixed I waited for twenty minuets and nobody showed up. The keys get stuck in the doors a lot Neighbors have a ton of people over and take up parking spots for residents. Workers are nice all the time, beautiful inside designs of townhomes I plan to live here for as long as possible the place is great can't control your neighbors. response from property - Thank you for your feedback! I would like to discuss your concerns in hopes of turning that 4 into a 5! Treat you like familysubmitted by Stacy D. - Aug 25, 2018 |Recommended: YesIt is great They treat you like family. The office staff was really helpful in helping us get settled in since we had to move in without even seeing the apartment first. response from property - Hi Stacy, Thanks so much for submitting your review. We try our best to treat all of residents the way we'd like to be treated and we are so happy that it shows! response from property - Hi Tia, Thanks so much for the review, and thank you for calling Ashton Ridge at West Creek your home. Property is beautiful and well keptsubmitted by Michael P. - Jun 29, 2018 |Recommended: YesI have enjoyed my time living here, the staff have been very helpful and thorough with any questions or concerns I have had over the past year, I do not have any complaints about the staff as well as the living environment, I appreciate all their hard work and attention to details and efforts to keep the environment as amazing as it is. response from property - Thank you so much for your kind words! Hearing this makes our jobs worth doing! We appreciate any feedback and suggestions as to how we can continue to improve the quality of living here at Ashton ridge at West Creek! response from property - Hi Kristen! We are happy you are enjoying your stay here with us! Please let us know how we can turn that 3 into a 5! 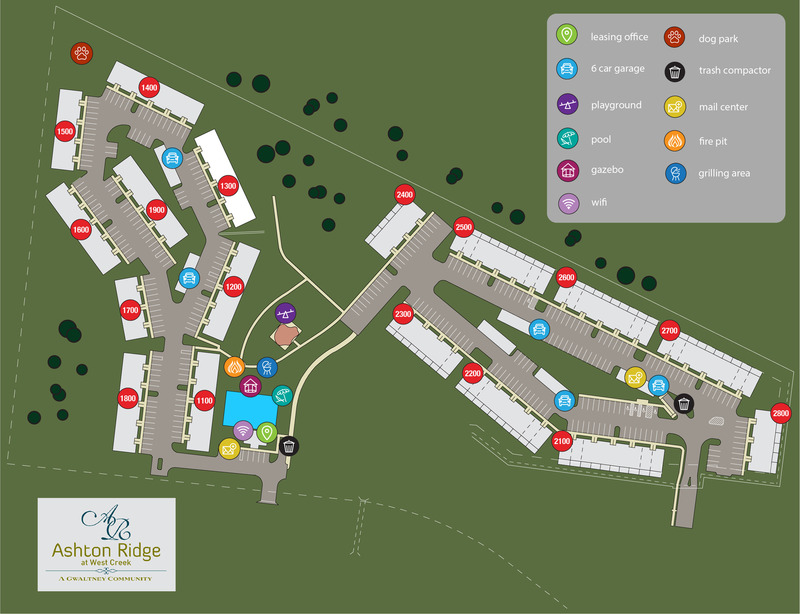 We are eager to make your residency at Ashton Ridge at West Creek a 5 STAR Experience! Lovely apartments with plenty of space.submitted by Ginelle C. - Jun 14, 2018 |Recommended: YesNice, the appliances are ab little cheap and the rules vary strict, not bad. response from property - Hi Ginelle, We truly appreciate you taking the time to submit a review for us. We'd love to set up a time to speak with you so we may discuss your concerns.